Living in Michigan, I am fortunate to have in my community great local farms and orchards that grow a wide variety of berries and other fruits. Compared to our long, cold winters, however, the growing season always seems so short. For this reason, the greater part of my summer was spent making various jams, fruit butters, chutneys, and sauces as each new fruit came into season. This is my effort to preserve the bountiful harvest in anticipation of the winter to come. Popping open a fresh jar on a gray winter’s morning to spread on toast or spoon into oatmeal should do just the trick to brighten anyone’s spirits, encouraging fond memories of summer past. Beyond the typical uses, though, jams or preserves or butters (or whatever you might have) can make a solid basis for a vibrant basting or dipping sauce – just add a little vinegar to temper the sweet or add chilies for heat and you are on your way to creating more excitement in your meal. In yet an entirely different direction, often I like to tuck dollops of jam into baked treats for use as pastry fillings. All this is to say that a lot of potential is sealed away in those little glass jars! Perusing Arbor Teas’ extensive line of fair trade, organic loose teas, I came across their Organic Vanilla Bean Black Tea. This tea is unique in that it is blended with large bits of organic vanilla pods. If you’ve ever purchased a vanilla pod (or even just enjoyed the flavor of genuine vanilla beans), you will understand the decadence of this addition. Immediately it struck me as a perfect match for the beautiful Sweet Vision plums I’d purchased from the farmer’s market to make plum butter. The organic black tea adds a welcome astringency to the tart-sweet plums and the sensual hint of vanilla does not go unnoticed. Pack loose tea into filter bags, cinch together ends of bag and tie closed with twine. Cut plums into quarters and discard pits. 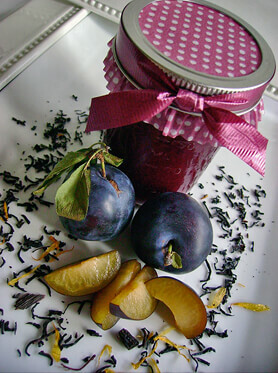 Combine quartered plums with lemon juice, sugar, and tea-filled bags in a large stockpot. Bring to a boil, stirring frequently. Boil hard for 5 minutes. By this point the plums should soften considerably. Remove and discard tea bags. Pass cooked plums through a food mill to separate skins from pulp. Return pureed pulp back to stockpot. Simmer 1½ – 2 hours, stirring occasionally, until the puree is reduced to a thicker, sauce-like consistency. Ladle plum butter into warm sterilized jars and process in a boiling water canner for 15 minutes. Alternatively, you can cool the plum butter to room temperature and store in the refrigerator for up to 1 month. This should yield enough to fill about 8 ½-pint jars—enough to share as a gift as well as enjoy for yourself.